Proudly Serving Colorado for over 25 years. Or Call (303) 452-5378 to Schedule Appointment. Getting your auto glass fixed with Quick-Set is fast and easy. All windshield replacements and repairs are of the highest quality and safety. We offer some of the most competitive pricing in Colorado. 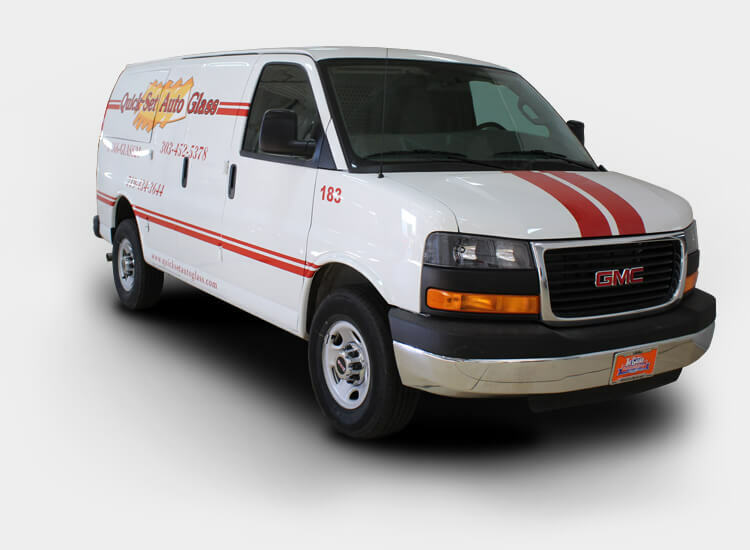 Convenient and reliable service throughout Colorado. Such a pleasant experience from when I called to schedule to when it was completed. Customer service rep on the phone was so friendly and professional, even when I had to call back to reschedule. Andre did a really nice job installing the new windshield and replacing the rear view mirror. I highly recommend this company and will definitely use them in the future. Great customer service. Jessie was on time. He was friendly and respectful of my time and car. Quick Set is a great place for all auto glass needs. Thanks Jessie and Quick Set! Andre replaced my windshield yesterday and did an excellent job! He was a pleasure to work with and made it totally painless. He arrived on time, was polite and friendly, efficient, explained everything he'd done and even tightened my rearview mirror that he found was loose. Thank you for a job well done! Have used them for work and for personal vehicles. Staff is friendly. Technicians show up on time, are professional, and I have never had an issue after having work done. Their prices are some of the best in the greater Denver area. Our technician, Jessie Rodriguez, was really helpful. The glass for my minivan was not correctly ordered, and Jessie drove to Denver from Fort Collins on a Saturday to pick-up the correct windshield and got it installed the same day. Awesome service! Great company! They are very professional and their prices are great. Our company uses therm for our fleet vehicles and personal vehicles. I highly recommend them. The office that took my info and got the job set up was exceptional. The next day service was awesome. Thanks to the technician Leon who did a remarkable and clean job. It's great to see there is still integrity in the work force. I will definitely use and recommend your company to others. Thank you all for a great experience. My technician, Jeff, was prompt in arriving. The installation was done quickly and efficiently. Jeff was professional, courteous, and very knowledgeable. I would recommend Quick-Set Auto Glass to anyone who needs auto glass work. Called on a Monday for a quote, definitely cheaper than Safelite and other Auto Glass companies. They came the next day to my job and installed the new windshield. Tech's name was Andre, he was great, fast and friendly. He went over the bill and care instructions before he started working, I will definitely use them in the future, and send people their way if asked. Got a large chip in my windshield and they sent someone out to my house the same day to get it filled in. Matthew was very professional and made quick work of it. This is the second time I've used Quick-Set. They are about half the price of Safelite and you get to talk to a real person on the phone rather than a 1-800 number. Would not hesitate to use them a third time. I have been dealing with Quick-Set Auto Glass since they started opened. I had my first windshield installed by them on April 24, 1996. Since that time, I have used no one else. I have continued to pound it in the head of all my friends that they will get 1st class service and premium-rated glass with service where they want it. I can't say how much I appreciate Quick-Set Auto Glass coming to my home and repairing my back glass the very next day. Leon was very friendly and fast. He did an amazing job and I would highly recommend this company. In my opinion, they are better in every way than their competition. I just had my windshield replaced by Leon and he did a fantastic job. I even accidentally made him make an extra trip because my bad information caused them to bring the wrong windshield. I didn't realize I had a heated lower windshield to keep the wipers warm. He was very friendly and professional. I wish I had called you all sooner! Mobile services for Denver, Colorado Springs, Aurora, Boulder, Broomfield, Castle Rock, Centennial, Greely, Fort Collins and more!